This weekend at the FIA GT1 race, we got a preview of the specifications for the Nissan GT-R FIA GT3 . The car was first tested last week, and will run a limited schedule this year. GT3 cars are not as radical as the GT1 cars. They have iron brakes, less widening, less rubber, different engine configurations. A few examples are Lamborghini Gallardo, Aston Martin, Mercedes SLS, BMW Z4, Porshe RSR. 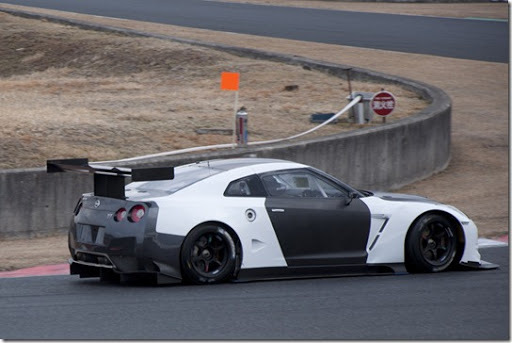 The car shown above will run a standard Nissan GT-R V6 engine, the VR38DETT. As all cars in GT3 are rear wheel drive, it is converted to rear drive with the GR6 transmission/transaxle swapped with a Hewland transaxle. Looking forward to some more details, and seeing it on the track.